It seemed like the amazing HTC Vive virtual reality headset would be the first to market—ahead of Sony’s Morpheus and the Oculus Rift. That’s not necessarily happening. 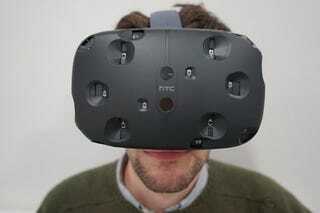 According to a new press release, consumers probably won’t be getting their hands on Valve VR until 2016. Shame. While originally, the Vive was set to ship this holiday to consumers (here’s the proof) a Valve press release now suggests a staggered rollout: only “a limited quantity of community and developer systems” will be available this holiday, with consumers having to wait till the first quarter of next year. For those keeping score, that means all of the major consumer VR headsets are now slated to arrive at roughly the same time. The final Oculus Rift is also due in Q1 2016, and the Sony Morpheus in “early 2016” last we’d heard. Why the delay? Can’t say yet, but financially, Vive manufacturer HTC hasn’t been having a particularly good time as of late.